Diesel submarine B-345 headed by Capt 2 rank Yury Konkin turned 16 in warming-up for her first cruise in 2010; by the way, the date of the sub's birthday almost coincide with Submariners' Day. At an early date the sub will have to carry out training tasks within flotilla. With this in mind, after festive dinner the crew proceeded to thorough preparations for real challenges. This submarine by no means can repine at unhappy lot. No later than in her first year in service, the sub under command of Capt 2 rank Sergei Smirnov excellently carried out patrol tasks. The same success was achieved in the next training period. In 1995-1996 the crew was rated the best in Pacific Fleet in followup of combat training; since 1997 to 2002, in 2004-2005 and in 2007 the crew gained the lead in submarine brigade. Last year the first place in combat training was again taken by the crew of B-345. The sub has changed many commanders through 16 years but one thing has been always invariable – the aspiration to keep leading position. For instance, the crew led by Capt 2 rank Rodion Tiurin many times won the Navy Commander's Prize, so the challenge award remained at the fleet forever. When the sub was commanded by Capt 3 rank Andrei Dergousov, she distinguished herself in the exercise under auspices of Admiral of the Fleet Vladimir Kuroedov; the sub commander was awarded with a special prize. The same Dergousov's crew achieved good record in state trials of a new submarine designed for Chinese Navy. Ex-commander Capt 2 rank Alexander Bardowsky had also directed lots of his energies to the crew. "We try to make the best use of the past experience and enrich combat traditions with our achievements", told executive officer of Varshavyanka Capt Lt Ivan Sazhayev when we got aboard and not without difficulty – specific skills are required – climbed down the narrow trunk to central station. "We accomplish not only combat tasks but diplomatic ones like foreign visits. Example, in 2006 the sub's crew along with PF task unit visited Japan. Through several days spent at the port of Maizuru the sub was visited by hundreds of locals and military servicemen showing great interest to Russian submariners and equipment. However, everything is certainly aimed at maintaining high combat readiness of the submarine. In 2008 the whole crew received training at Navy Training Center and then successfully carried out ocean patrol. Last autumn we took part in the exercise with large ASW ships – laid mines, attacked the "enemy", secretly reached appointed zone. All launched torpedoes appeared to lock on the target, so we'd destroy it in real combat". It is exactly when a sub is at sea her crew gradually integrates into a whole combat organism. Obviously, trainings at the pier and theoretical learning of duties also do their good, although nothing compares to practice away from the land! By the way, everybody remembers an old tradition of "sailorizing". In the break between endless alerts a crew always finds a time to conduct submariner's initiation ritual with newcomers. Old salts say not every guy can master this strenuous profession. This service is more than specific. That is why only decisive, courageous and fully devoted to embraced job people remain here. 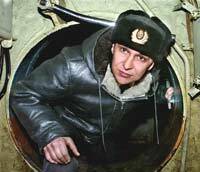 "To serve in such subs is a sort of lifestyle and even special state of mind", told Capt 1 rank Sergei Kitov who had performed several long-rage cruises to Indian Ocean. "Honesty to himself and to the crew is above all things distinguishing a submariner. By the way, the service itself sometimes teaches to take life in a good fun. It was always like that: you're returning to base, you've got shaved, packed bags and think of approaching native pier in the morning, but when you wake up – snooks! Overboard is ocean again! The sub sails the other way, patrol goes on and you have to serve underwater for a couple of weeks... "
Current commander of Varshavyanka Capt 2 rank Yury Konkin has also carried out a plenty of patrols. In opinion of his colleagues, he has virile character and gained authority because of his knowledge, experience, talent to work with people and create favorable atmosphere in the crew. Truly, he treats everyone like a father and this makes all his subordinates serve thoroughly. Here all problems are resolved with his participation. No officers from the first crew now serve at B-345. Most of them hold higher posts like former EO Alexander Gorbunov who is Capt 1 rank and senior officer of Pacific Fleet Combat Training Department. The last "old-timer" whose name is enchased on commemorative plaque in the tiny mess-room is Capt 3 rank Vitaly Dimidov recently gone ashore and become an instructor in naval institute. Their places are taken by young worthy people who are unindifferent to the future of Russian submarine fleet. Among them are hereditary naval serviceman Capt Lt Ivan Sazhayev, department commanders Capt Lt Sergei Ponamarev and Capt Lt Alexei Riadinsky. Obviously, in many cases officers can be transferred to various subs within several years, in contrast to warrant officers who are known for stability. That is why new lieutenants coming to the crew are not ashamed of asking skilled WOs. Among submarine veterans is chief boatswain, senior warrant officer Nikolai Chumakov and technician of mine and torpedo department Alexei Dmitriev. The latter one is native of Tver region, he had served three years of compulsory service as torpedoman; then he signed a 3-year contract and served in Kamchatka. Later on he was promoted to warrant officer and proceeded service in Far East. "Through my life inside strength hull I recall many things", says Alexei. "Sometimes I dream of cruises when we ran into gales. The hardest thing is to overcome rocking in ocean wave since it is longer than a common sea one. In such moments watch officer and steersman have to be fastened with belts to keep their work places. I can't forget emergency while sailing to Japan. Electric arc punctured generator in 4th compartment and ignition occurred. The generator was immediately deenergized and the compartment was pressurized. Engineer Capt 3 rank Boris Panteleev and chief of motormen WO Ivan Khatulev along with their subordinates were fighting the fire inside compartment. Of course, all crew was involved in this alarm situation. Consequently, the breakdown was prevented and nobody died. All tasks of the visit were successfully completed. Upon returning to base, distinguished personnel were awarded with medals. Everybody in the crew understands that reduction of compulsory service term to one year is unlikely contributes to improvement of naval skills. That's why they all support governmental intention to post only contract sailors in submarine fleet. Surely, there are number of problems to enlist such mariners, not everyone can withstand the stresses of day-night watch service and special drills. Some guys go into civvies right after the first contract. But most of crewmembers are those who tuned themselves to submarine life and found their position in the service. For example, chief electrician petty officer 1 class Alexei Zagibalov and sonarman petty officer 2 class Evgeny Podoinitsyn had signed the second contract. Among those who have already given their hearts to the Navy are petty officers 2 class Valery Gubar, Ivan Mikhailov, Alexander Nekrasov. "Those are conscientious guys, they're a firm basis for the crew and the Navy in general", says the sub's EO convincingly. "Pacific Fleet command does whatever possible to support contract servicemen. Our patrons from town administration of Mogocha, Chita region render assistance in improvement of crew living conditions. Much of sports equipment, all kinds of TV and video facilities, wall clock in the mess room, repaired barracks – all that is their aid. The relations were established when the sub commander was Capt 2 rank Alexander Dementiev who is currently holds the post of brigade executive officer". ...First course task has been recently accomplished. To do that, the crew had been intensively studying the whole structure of the submarine. All crewmen have been groveling documents, duties of personnel, and materiel. Everyone was inculcated that scrupulous working out all L-1 elements would ensure good backup for further combat training. At present, the crew trains single elements of second course task and thoroughly prepares sub's hardware for coming sortie. Prior to carry out combat drills like arms use against the "opponent", submariners bring up all things to automatism at the base. This is primarily related to personnel of combat stations and command posts, and those who involved in torpedo use. It is necessary to operate detecting and observation equipment properly, perform course plotting, input data to weapon systems, and many other things which are essential at sea. All this skills are gradually achieved by the crew during systematic trainings and drills.